I’ve just got a simple outfit to share with you today as the garment I was planning for this month’s Mood Sewing Network project has taken slightly longer than anticipated, plus my weekend sewing plans were scuppered by lack of a zip! Aargh! Luckily I picked up quite the selection of gorgeous fabrics in the Mood Fabrics Los Angeles branch when I visited the U.S. last month and I’ve already sewn a couple of other bits up. I absolutely loved the LA store and found all the staff to be so welcoming; helping me pull out bolt after bolt as I was being my typically indecisive self! I was pretty overwhelmed by the size of the place and variety of fabrics available when I first got there and spent a good couple of hours looking around. With limited suitcase space I was trying to make careful choices and only buy things which I had a project idea for. 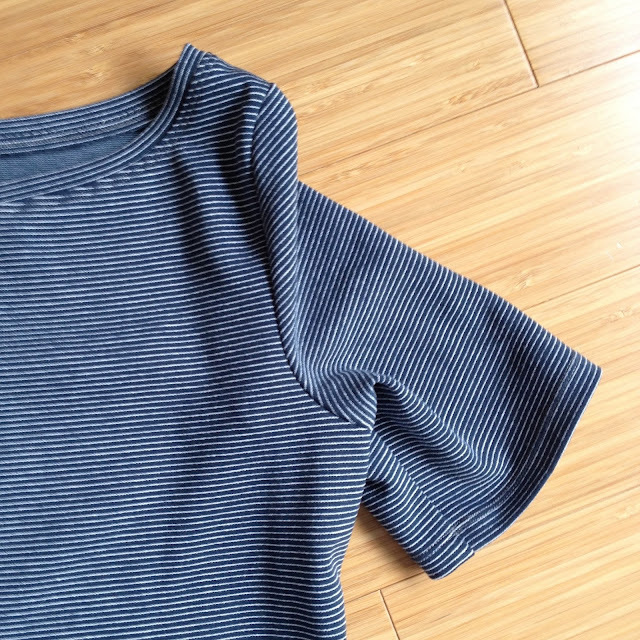 This striped Theory jersey was one of the first things I picked, it practically jumped off the shelf and into my hands! It was screaming at me to become a simple shift style t-shirt dress and that’s exactly what I turned it into pretty much as soon as I got back to the UK. It’s unfortunately sold out online but I’m generally tempted by every other Theory fabric that pops up on the site! As I hoped it turned out to be the perfect fabric for this kind of garment. 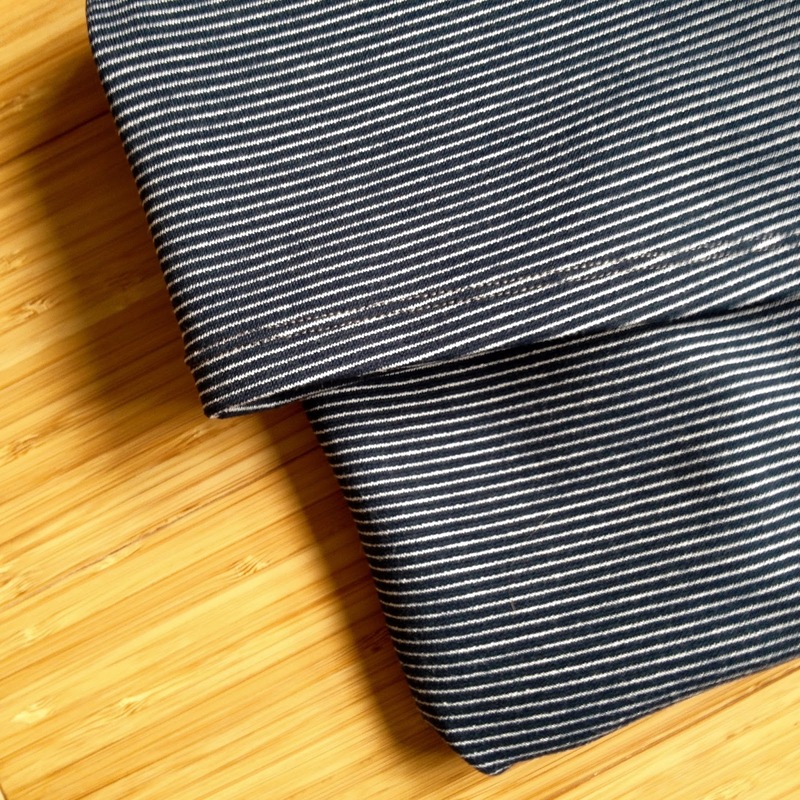 It is a fairly thick and stable jersey and actually has a double faced quality as the stripe is woven into just the right side of the fabric and the reverse is a plain grey/blue marl. As the stripe is so fine I didn’t attempt any sort of pattern matching. It was genuinely a pleasure to cut and sew with this stuff. It’s really stable and didn’t fray at all; I had lovely crisp edged pattern pieces to work with. I employed my standard knit-sewing techniques to make this. I assembled the seams with a narrow zig zag stitch on my machine (using a ball point needle) and finished them together on my overlocker. I personally find this to be the most accurate and robust method. I chose to use a grey thread despite the fabric being a dusky blue as I didn’t have anything on hand to match and grey is great for becoming fairly invisible next to most colours. I used a twin needle to finish my hem and cuffs and also to topstitch round the neckline. My twin needle and I got off to a rocky start but now it’s my favourite finishing technique for knits and I use it whenever I can! I used the Mesa Dress pattern which is from Seamwork Magazine a couple of months ago and only needed a yard of the 1.5 yards of fabric I bought. It’s actually my third version of the dress (I haven’t got around to blogging the other two yet!) and I’m still fiddling with the fit as I hope it will become my go-to pattern for something both speedy to make and easy to wear. My first version was a size S with no adjustments and while it fits as I think is intended it was a little too clingy for me. I wanted a looser shape. I had experimented with adding some width to the side seams on my second version but while this helped a little the main area I had fit problems with was the shoulders and bust. Surprisingly the shoulders seemed too narrow for me (I usually have the opposite problem) and that was causing everything to ride up and the neckline to sit funny whenever I moved. On this dress I tried adding width down the centre front fold line (1.5″ total) so I had more room at the shoulders and bust and kept the looser fit I liked at the waist and hips. It also meant I didn’t add anything to the back pattern piece as I liked the amount of ease in that area, although looking at these pics I think I could stand to attempt to add some shaping at the waist. Along with the adjustments I made, this fabric really helped me to achieve something closer to the fit I wanted to. It’s got a bit more body and structure than something like a viscose jersey so it holds a shape and doesn’t cling. The slightly spongy feel means it does need a really good press though. Despite being slightly wary of how mini the skirt length was in the promo pictures for the pattern I didn’t adjust the length for the version and I really like it. I did choose to omit the hem slits at the side seams as I didn’t love that feature on my first version. I just wanted something super simple and easy to wear. Despite the not yet quite perfect fit this is a garment that I love and has received a tonne of wear since I finished it a couple of weeks ago. I like the shape of the neckline and the length of the sleeves in particular. I’ll be back a little later in the month with a slightly more adventurous and interesting project for you…It’s turning out beautifully so far!